The new Z997R is John Deere’s most powerful zero-turn mower featuring a 37.4 hp Final Tier 4 diesel engine. The Z997R excels in the toughest mowing conditions with front-mower like power in a zero-turn mower while providing the productivity and dependability commercial landscape contractors value. The model comes equipped with a 60-in./72-in. 7-Iron™ PRO side discharge deck or an industry exclusive 60-in. 7-Iron™ PRO Mulch On Demand™ deck. A 60-in. 7-gauge fabricated rear discharge deck is available as well. For peak operator comfort, the Z997R boasts a Comfort & Convenience package with ergonomic grips, power deck lift, and PTO cutoff in the handle. 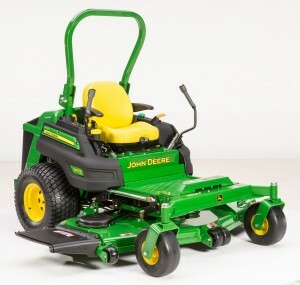 This mower was featured at 2014 GIE+Expo.